This low-growing perennial creeper is a member of the primrose family, and is found in damp habitats, in woodland and by pond and stream margins. 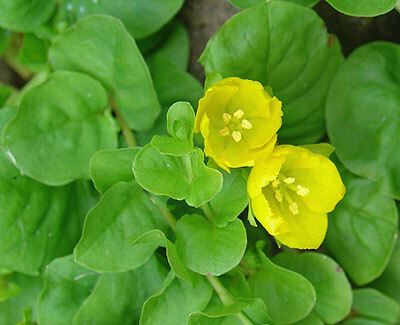 The first golden-yellow cup-shaped flowers of the Creeping-Jenny appear in May, and continue until mid August. It has glossy, rounded to oval, green leaves that are arranged in a ladder formation, decreasing in size along the stem. The plant is toxic if eaten and can be a skin and eye irritant.